Bald eagles are so incredible to see let alone work with. We are proud to have a very good release rate with our patients including Bald eagles, but there are times when it is not to be. No matter how many years I have worked with wildlife it is something you really never get used to. After forty plus years euthanizing a patient is still hard even when we know it is the best thing for the patient. People assume we can euthanize a patient with little conscience or feeling. Some people do perhaps but it is not the case at REGI. I tell my interns if you reach that point where you don't feel anymore you need to consider another field. On Saturday night of the Memorial Day weekend I received a call about a Bald Eagle down on the ground near Tigerton, WI. The bird was located over a half hour drive from the REGI facility. It was getting dark fast and I knew it would be dead dark by the time we arrived in Tigerton. My husband and I mobilized quickly and were on the road within minutes after the call. 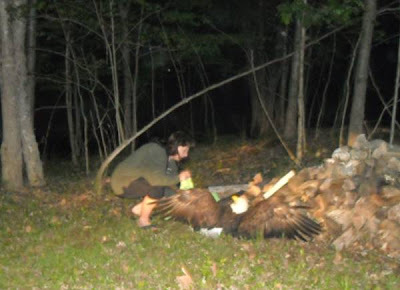 The situation was the eagle was found by group of friends camping therefore the actual site was fairly remote. We traveled down narrow roads and finally through farm fields etc before we reached the bird. I am very grateful to the group of people that found this bird. We don't usually go out after dark to capture Bald Eagles, but their description of the situation was compelling. That, and they were going to stay with the bird until we got there so it did not wander off and become hidden in the forest. We arrived to find the people doing exactly as they said. The adult male eagle was slumped against a woodpile. I was able to approach him quickly. He didn't fight the capture. The photos show the process of approaching the bird and then gathering him up for the trip back to REGI. When I saw the right leg I was sickened. The leg had obviously been caught in a leg hold trap put out to trap mammalian predators. 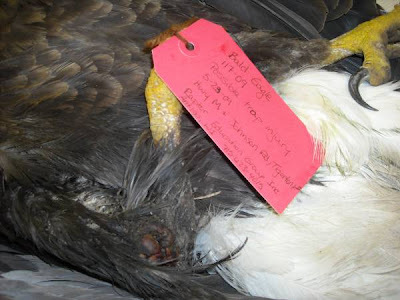 There are "proper" ways to set traps that all but eliminate bald eagles and other non-target animals from becoming accidentally trapped and then there are the "improper" methods. On getting back to REGI and examining the eagle we found the injury was at least several weeks old. The eagle weighed only five pounds. That means it was at least weeks trying to survive with this horrific injury. It would have been impossible for the bird to have gotten himself out of the trap. Someone had to have let him out. They would have had to know the leg was badly crushed at the joint and the other was dislocated and yet rather than finding help for this magnificent adult eagle they simply "let him go". He was released to starve. I cannot even imagine what they were thinking except perhaps that they would be in trouble for trapping a bald eagle. 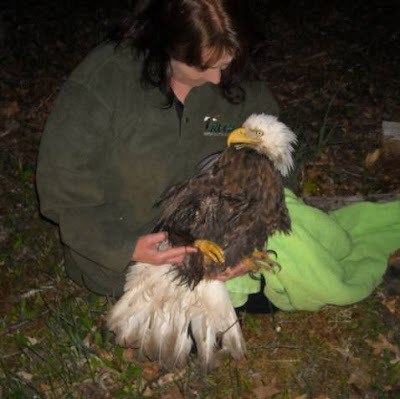 The end result was the eagle had to be euthanized. The right leg was necrotic and there was no way to repair it. The other leg was dislocate likely from the eagle pulling to try to free himself from the offending trap. Some stories don't end well. 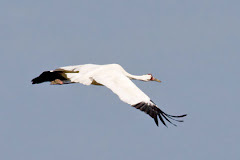 The case has been reported as it has to be to USFWS. My thanks to the people that found the bird and got him help. At least he was warm and no longer in pain when the end came. Sometimes that is all we can do. What a sad story. I don't understand what people are thinking sometimes. Think about you guys still even though it's been 7 years since I was there. Keep doing the great work you do there!